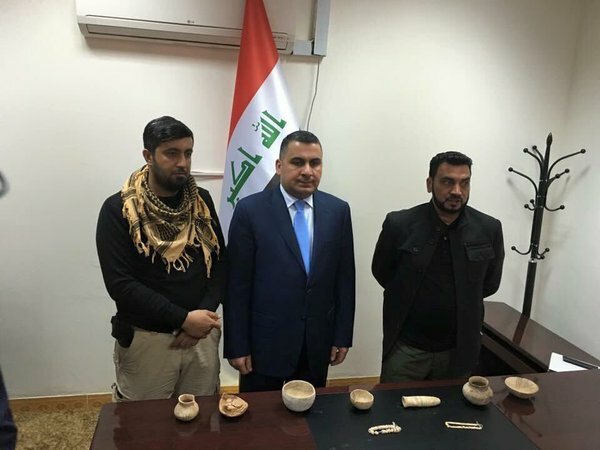 When Steven Ishak Nabil (Ummaya Al Jabbara@stevoiraq) shared the news of the raid on the Islamic State by the Sunni Popular Mobilisation Unit (PMU) of Ummaya Al Jabbara, he published a photograph of all nine of the antiquities that had been recovered. [Correction: I originally identified the force first as Kurdish, then as Shia. While it includes (Shia) Kurds, while it is an (ethnically mixed) overwhelmingly Shia force, and while Iraqi News identified the responsible unit as a Shia unit, Ummaya Al Jabbara is a Sunni unit. It is named after Umayyah Naji Jabara, who was killed in combat against the Islamic State in 2014, whose father Sheikh Naji Jabara had been killed by al-Qaeda in 2007.